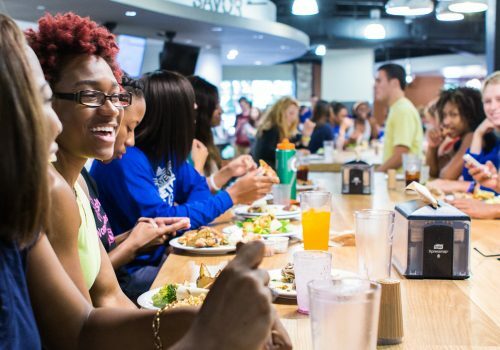 Highsmith Union Food Court: A-la-carte meals in a variety of flavors, including made-to-order flatbread pizza and salads, sushi, and American comfort food. Argo Tea: Café serving coffee, tea and quick, healthy bites. Located in Ramsey Library. Rosetta’s Kitchenette: A local favorite! Serves vegetarian and vegan fare in the Sherrill Center’s Wellness Café. The Down Under: Snacks, made-to-order subs and salads, and Starbucks coffee drinks. Find it on the bottom floor of Ponder Hall. Coming soon to Highsmith Union! Roasted, serving locally-roasted Dynamite coffee and other coffee beverages. Visit our Dining website for daily menus and more.